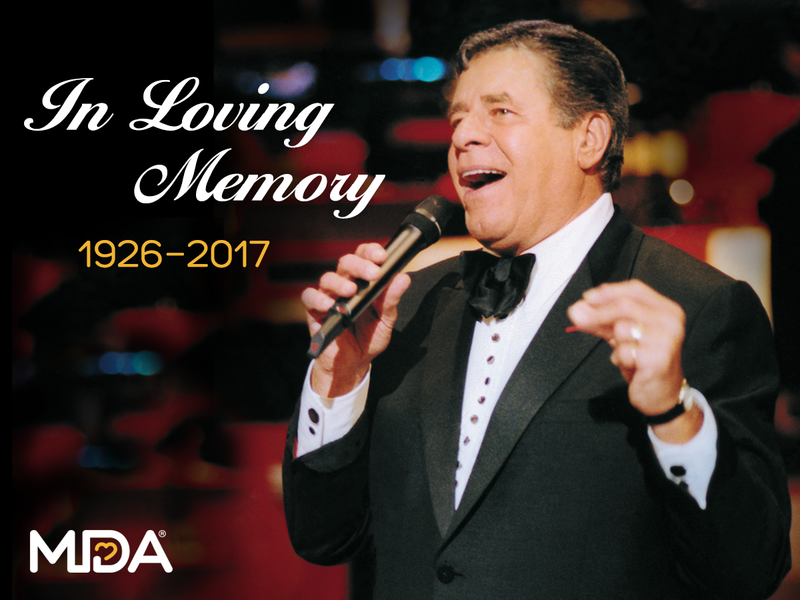 In response to the passing of legendary comedian Jerry Lewis, former national chairman and telethon star of the Muscular Dystrophy Association, the extended MDA family today mourns his loss. Jerry was 91 and lived in Las Vegas, with his wife Sam of 34 years. The Muscular Dystrophy Association is deeply saddened by the death of beloved comedian, performer, humanitarian and former MDA Telethon star and national chairman Jerry Lewis. MDA would not be the organization it is today if it were not for Jerry’s tireless efforts on behalf of ‘his kids.’ His enthusiasm for finding cures for neuromuscular disease was matched only by his unyielding commitment to see the fight through to the end. Jerry’s efforts on the annual MDA Telethon transformed the broadcast into an American tradition each Labor Day weekend for 45 years. Though we will miss him beyond measure, we suspect that somewhere in heaven, he’s already urging the angels to give ‘just one dollar more for my kids.’ Thank you Jerry, you are our hero. God bless you. We send our deepest condolences to his wife Sam, his daughter Danielle and his sons, Gary, Ronald, Scott, Christopher and Anthony, and the entire Lewis family. Lewis was one of the world’s most successful performers. He was renowned as a comedian, director, writer, producer, inventor and headline entertainer on stage, screen and television. His tireless humanitarian efforts were the hallmark of the MDA Telethon for 45 years. Lewis served as MDA’s honorary national chairman during the decades when the organization was developing the most comprehensive program of research and medical and community services of any nonprofit health agency in the country. Through telethons and other fundraising activities carrying his name, Lewis brought worldwide attention to the fight against dozens of neuromuscular diseases. During Lewis’ lifetime, MDA-funded scientists discovered the causes of most of the diseases in MDA’s program, developing treatments, therapies and standards of care that have allowed many living with these diseases to live longer and grow stronger. “To see this breakthrough tells me that indeed in my lifetime, I’m going to see ‘my kids’ better than they are today,” Lewis said at a press conference during the announcement of the discovery. In September 2016, Jerry, at 90 years of age, once again witnessed remarkable progress when the FDA approved the first-ever drug for the treatment of Duchenne muscular dystrophy. MDA has funded more than $1 billion in neuromuscular disease research since 1950, with an unprecedented three drugs approved for Duchenne MD and spinal muscular dystrophy (SMA) in the last year illustrating the vibrancy of its research program and the impact Lewis has had on neuromuscular research. Lewis became associated with MDA in 1952, shortly after the organization was formed by a few adults with muscular dystrophy, parents of children with the disease and the late Dr. Ade T. Milhorat, then virtually the only American physician specializing in muscle diseases. In the early 1950s, Lewis and his show-business partner, Dean Martin, held telethons broadcast in New York for MDA. The children with neuromuscular diseases that Lewis met during numerous personal appearances for MDA began to call themselves “Jerry’s kids,” in gratitude for the compassion they received from the country’s favorite young comedian. Lewis said over the years the children referred to themselves so often as “Jerry’s kids,” that it finally became a familiar phrase to millions. During the next 50 years, Lewis courted sponsors for MDA; appeared at openings of MDA care and research centers; addressed meetings of civic organizations, volunteers and the MDA Board of Directors; successfully lobbied Congress for federal neuromuscular disease research funds, and made countless phone calls and visits to families served by MDA. In January 2016, MDA unveiled a revitalized brand reflecting a renewed commitment to accelerate treatments and cures for the kids, adults and families it serves. To mark the occasion, Lewis taped a special message to the MDA community, urging continued support for MDA and the families he has championed for decades. In his heyday, Lewis convinced the top stars of music, theater, film, television and sports to appear on the telethon — without pay — to help spread the MDA message. Viewers saw hundreds of the biggest celebrities, including John Lennon, Jerry Seinfeld, The Rolling Stones, Johnny Cash, Cher, The Jackson 5 and Celine Dion, appear on the telethon over the years. On May 16, 2011, Jerry announced that he was retiring as host of the annual MDA Labor Day Telethon. MDA held its last telethon in 2014. Lewis was honored around the world for his efforts on behalf of MDA. Lewis also received the Jefferson Award from the American Institute for Public Service; the French honored him with their two highest awards, the Legion Commander of the Legion of Honor and designation as Commander in the Order of Arts and Letters; U.S. Department of Defense Medal for Distinguished Public Service; honorary doctor of humane letters degrees from Mercy College in Westchester, N.Y., Emerson College in Boston and Chapman University in Orange, Calif.; and numerous other humanitarian awards. Regarded as the most effective fundraiser in television history, Lewis was inducted in 1991 into the National Association of Broadcasters Hall of Fame. The same year, he received a Comic Lifetime Achievement Award during cable television’s annual ACE Awards. He was inducted into the International Humor Hall of Fame in 1992. In 2004, he received the Los Angeles Film Critics Association’s Career Achievement Award. In 2005, he received the International Press Academy’s TESLA Award in recognition of visionary achievements as an innovator in the field of visual technology for the cinema arts; that same year, in Berlin, the Axel Springer publishing company bestowed upon Lewis a Golden Camera Lifetime Achievement Award. Lewis was recognized as the 2005 recipient of the Academy of Television Arts & Sciences Governors Award for his accomplishments with the telethon. In 2009, the Academy of Motion Picture Arts and Sciences recognized Lewis with one of its greatest honors, the Jean Hersholt Humanitarian Award. The award, named after actor, past Academy president and motion picture industry supporter Jean Hersholt, is bestowed by the Academy on an individual in the motion picture industry whose humanitarian efforts have brought credit to the industry. Lewis is survived by his wife, Sam; his daughter, Danielle; five sons, Gary, Ronald, Scott, Christopher and Anthony; several grandchildren and great-grandchildren; and was preceded in death by his son Joseph. MDA is leading the fight to free individuals — and the families who love them — from the harm of muscular dystrophy, ALS and related life-threatening diseases that take away physical strength, independence and life. We use our collective strength to help kids and adults live longer and grow stronger by finding research breakthroughs across diseases; caring for individuals from day one; and empowering families with services and support in hometowns across America. Learn how you can fund cures, find care and champion the cause at mda.org.